Research broadens concerns over the impact of the world’s most common weed-killer. Nick Carne report. Researchers from the University of Texas at Austin in the US say honey bees exposed to the organophosphorus compound, the active ingredient in Monsanto’s Roundup, the world’s biggest selling weed-killer, lose some of the beneficial bacteria in their guts and are more susceptible to infection and death from harmful bacteria. The researchers exposed honey bees to glyphosate at levels known to occur in crop fields, yards and roadsides. Three days later they observed that the insects had significantly reduced gut microbiotas. Of eight dominant species of healthy bacteria in the exposed bees, four were found to be less abundant. The hardest hit species, Snodgrassella alvi, is a critical microbe that helps bees process food and defend against pathogens. Native bumble bees have microbiomes similar to those of honey bees, and the researchers say it’s likely that they would be affected in the same way. 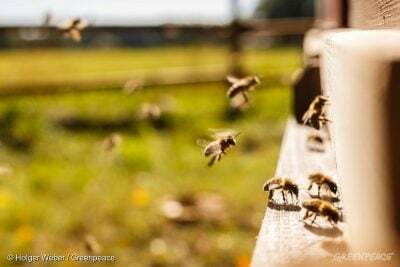 “It’s not the only thing causing all these bee deaths, but it is definitely something people should worry about because glyphosate is used everywhere,” says Motta. The compound is increasingly controversial and newsworthy around the world, with calls for it to be banned – primarily because of alleged links to cancer – alongside pleas not to do so by those determined to keep using their current approach to weed control. There is particular interest in the possible flow on from recent US court decisions to award a former school groundsman $289 million after finding that Roundup was a substantial contributor to his non-Hodgkin’s lymphoma. The court also refused to hear further arguments from Monsanto in relation to a determination that glyphosate is a carcinogen. However, just this month a Brazilian court lifted a ban on glyphosate and the French National Assembly rejected onefor the second time. Featured image is from Greenpeace.